Mitchell Time and Parking provides efficient and versatile time and attendance solutions to Austin, Texas. Like our parking services, Mitchell Time and Parking provides efficient and versatile time and attendance solutions to Austin, TX. We help companies in Central Texas significantly reduce payroll preparation and employee tracking time with our top of the line employee time clock software. 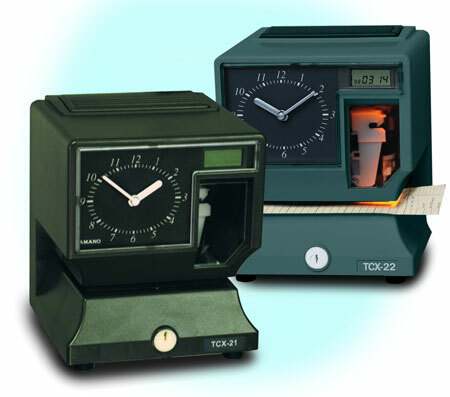 The TCX-21/22 Series have an easy to read analog clock face and digital date display. They also have memory backup in the case of power failure. Our PIX-21 Series is a minimal style electric time clock with a perpetual calendar and it can print 10 different messages. The MJR-7000 Series Computerized Time Recorder automatically calculate hours worked and separates regular and overtime hours to make payroll processing easier. Click here to download a brochure about this time recorder. Call our expert team today to receive additional information about our parking and time clock products and services. We are standing by to assist you!